Citation Information: J Clin Invest. 2018;128(8):3558-3567. https://doi.org/10.1172/JCI99081. 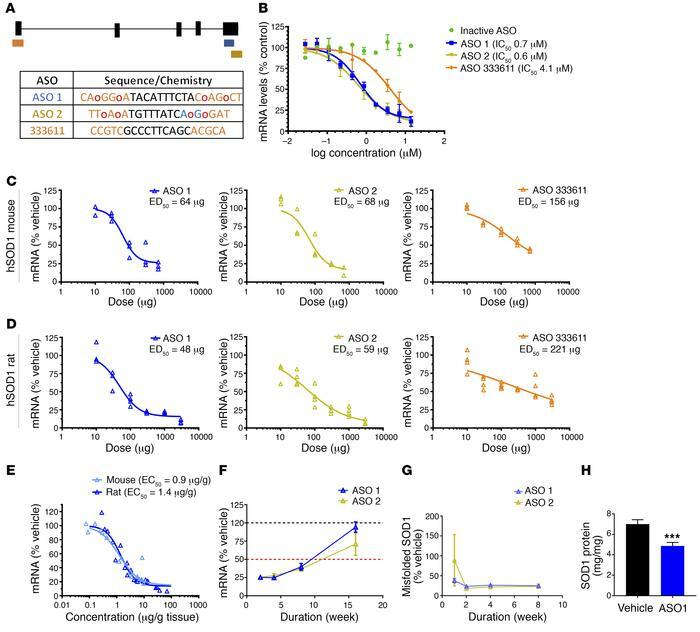 New SOD1 ASOs reduce mRNA and protein in vitro and in vivo, and are more potent than the previous SOD1 lead. (A) Oligonucleotides containing phosphorothioate backbone modifications (unmodified phosphodiester linkages noted with red o) and 2′-O-methoxyethylribose (MOE; orange) and (S)-2′,4′-constrained 2′-O-ethyl (cEt; blue) groups in the 5′ and 3′ wings were targeted to the 3′ UTR of SOD1 mRNA (ASO 1 and ASO 2), exon 1 of SOD1 mRNA (333611), or nothing in the human or rodent genome (inactive ASO). The sequences evaluated and location of chemical modifications are provided. (B) SHSY5Y cells were treated with SOD1 ASOs by electroporation. After 24 hours, SOD1 mRNA was measured. New SOD1 ASOs are more potent than the previous lead ASO (n = 2 per concentration, average ± range). (C and D) Candidate ASOs for human SOD1 were screened in mice (C) and rats (D) expressing human SOD1. ASOs were injected i.c.v. (mice) and intrathecally (rats) and mRNA was measured in lumbar spinal cord 2 weeks after dosing. Potent ASOs were identified that lowered SOD1 mRNA in both species with ED50 between 50 μg and 70 μg (n = 3 per dose, individual animals). (E) Tissue concentrations of ASO were measured and correlated with SOD1 mRNA lowering, demonstrating an EC50 of 0.9 μg/g in mice and 1.4 μg/g in rats (n = 24). (F) A single intrathecal bolus of 500 μg ASO 1 or ASO 2 was given to SOD1G93A rats. SOD1 mRNA levels were assessed in the spinal cord at 2, 4, 8, and 16 weeks after bolus. ASO 1 and ASO 2 suppressed SOD1 mRNA levels for more than 8 weeks (n = 2–7 per time point, average ± SEM). (G) A single intraventricular bolus of ASO 1 or ASO 2 was given to SOD1G93A rats. Misfolded SOD1 protein from spinal cord was assessed at 1, 2, 4, and 8 weeks after bolus (n = 7 per time point, average ± SEM). (H) Six weeks after a single intraventricular bolus of ASO 1, SOD1 protein was quantified in the lumbar spinal cord of SOD1G93A rats. *** P = 0.0005.